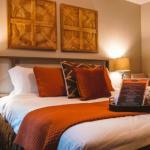 Situated in South Lake Tahoe Aerie Lodge provides free WiFi. 3.5 km from Washoe Meadows State Park and 4.4 km from South Tahoe Ice Arena the motel offers a ski pass sales point. The property is 6 km from Heavenly Ski Resort and 6 km from Tahoe Queen. All guest rooms in the motel are fitted with a flat-screen TV with cable channels. Rooms are complete with a private bathroom equipped with free toiletries while certain rooms will provide you with a seating area. All units include bed linen. Guests at Aerie Lodge will be able to enjoy activities in and around South Lake Tahoe like skiing. First Ride is 6 km from the accommodation while Gunbarrel Express is 6 km from the property. Reno-Tahoe International Airport is 69 km away.